Need a coffee table that showcases your sophisticated sense of style? Choose the Grand Coffee Table � you'll be glad you did. This elegant coffee table features a spacious top of espresso oiled veneer that is both practical and attractive. It also includes angled anodized copper legs that add a hint of luxury to a setting's d�cor. Select a coffee table that combines fashion and function like never before with the Grand Coffee Table. Veneer top is both spacious and stylish. Espresso top will match the d�cor in any living space. 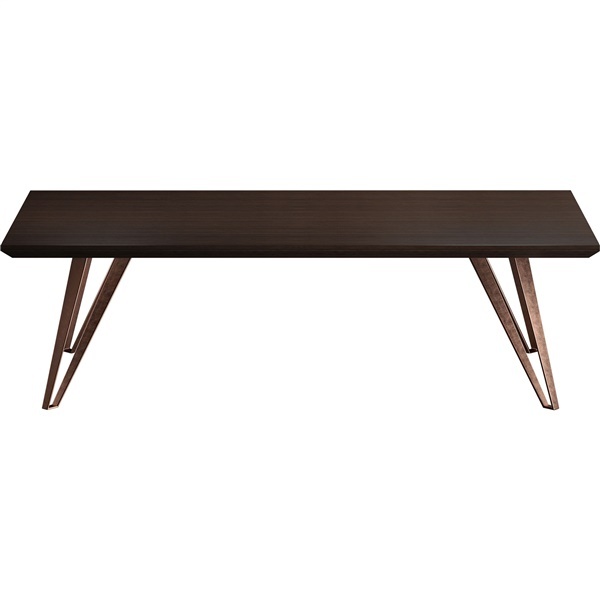 Angled anodized copper legs provide the coffee table with a luxurious look and feel. Minimalist-inspired design and slim profile give the table a captivating appearance.